The actual size of the hotel is not apparent at first glance, you may see a low rise building covered in a hue of white standing right next to the Duty Free but it isn't until you get inside that you get to have a good feel of how spacious the hotel really is. Le Charme Suites has an unarguably larger space than most of the hotels we might have been used to, even the elevators are larger and there's a good reason for that. Subic is a popular destination for Triathlons and where there are triathletes, there are bicycles and where there are bicycles, there needs to be more space! Le Charme Suites not only welcomes the guests, but happily accommodates the gears as well. The rooms are so spacious that a bike rack is available en suite. The hotel also keeps up with the latest technology available for the hospitality industry. Room switches are unlike the traditional, Le Charme Suites has touch sensitive switches that tells everyone to keep off the room or to set the lighting in a calm mood. The bed and linens felt high in thread count without the irritating static feel from the sheets. The pillows were all smooth to the skin that a deep slumber becomes inevitable. Breakfast, although wasn't buffet type was served in generous servings with a highly sumptuous list of choices fit for the western and Filipino taste buds. The ambiance is soothing with an enough amount of daylight that boosts such an energetic vibe. This place is one of my favorite spots in the hotel. Other than starting the day right with a hearty breakfast, Teppan 101 is also located just below the building. Teppan 101 offers a variety of comfort food that we are all familiar with. The Asian fusion of Japanese, Chinese and Filipino cuisine, available in one sitting makes the entire Teppan 101 experience worth it. With the chef cooking your dish in front of you, that's cherry on top and an assurance that you only get a freshly cooked course. Pair it up with the nearby Naicha milk tea, you are off to a great day. 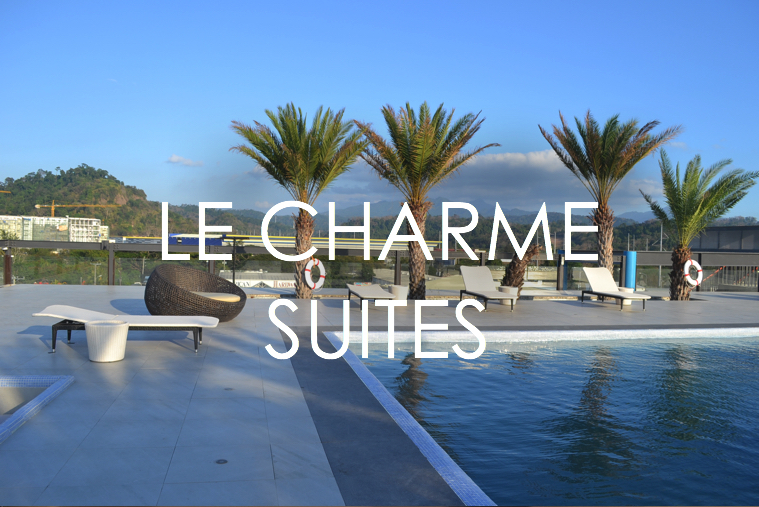 But what really is unrivaled with Le Charme Suites is a roof top oasis with a spectacular view of the silent city and the the lush greenery it is surrounded with. The middle eastern vibe in the pool area of the hotel is a visual delight that it is impossible not to be allured with. The palms on top of building adds so much character to the entire floor and the waters are wide enough to make a few laps.